NHL News : Rival teams storm into Philly as new GM Fletcher has an itchy trigger finger! Rival teams storm into Philly as new GM Fletcher has an itchy trigger finger! Imminent trade on the way? The Philadelphia Flyers entered 15th of 16 teams in the Eastern Conference with 24 points and have now lost seven games of nine. It could have gone either way last night as they faced the Columbus Blue Jackets and lost 4-3 in overtime, but the result stands and new general manager Chuck Fletcher is left with even more pressure to make a change to lead the team in the right direction. You may say that it's not the impression Fletcher gave during his introductory press conference earlier this week, however Issac suggests it might have been a ruse despite the fact that there is no mandate to start trading pieces. Yet. Fletcher has made it clear he has a win now mentality, which could put interesting trade baits and pending free agents on the block. As you guessed it, it does include veteran forward Wayne Simmonds. Simmonds is playing out the final season of a six-year, $23.8 million contract he signed with the team back in August 2012. 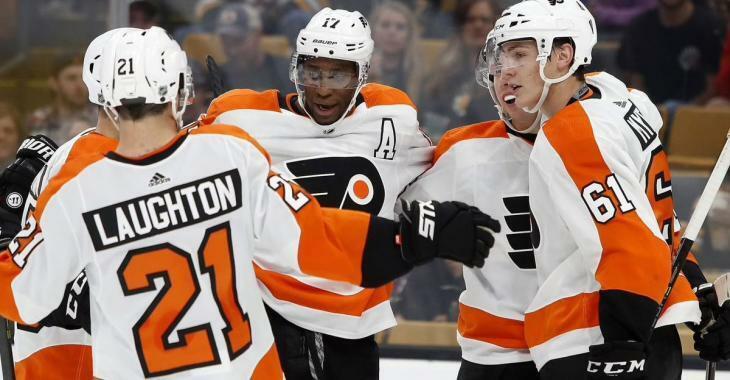 Ideally, Simmonds would like to remain in Philadelphia for the rest of his career, but it seemed that negotiations with former GM Ron Hextall weren't all that positive. According to NHL insider Elliotte Friedman, the recent change in management will impact what happens next with Simmonds. "Could Philadelphia’s GM change affect Wayne Simmonds ’s future? According to several sources, Hextall thought very highly of the powerful winger, but was unwilling to commit term to the 30-year-old. There are differing opinions on whether or not Simmonds was being shopped. Some said yes; others said Hextall preferred to wait and see if the Flyers stayed in the race. Now we’ll find out what Chuck Fletcher thinks," writes Friedman in his latest 31 Thoughts column on Sportsnet. Fletcher could see the benefit in trading the veteran winger to make the Flyers "a more well-rounded team defensively." The 12 scouts present last night at the contest were probably made aware of a potential return for Simmonds. So, how baldy his Fletcher's trigger finger itching?